Radio taxi aggregator Meru cabs has formed an alliance with eCab, a part of French taxi service provider Taxis G7, to expand its service offering in global markets. 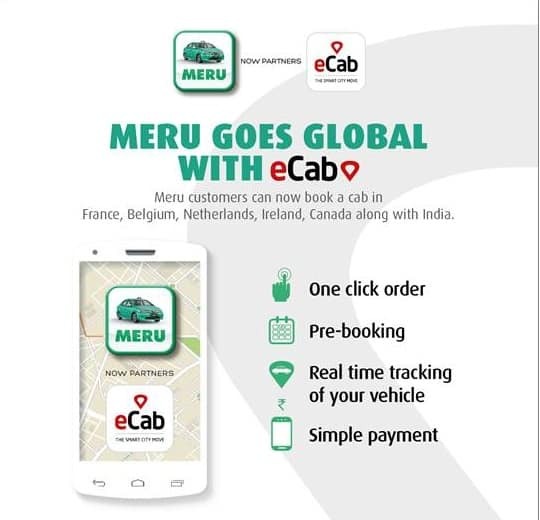 Under this partnership, Meru’s customer can avail the service of eCab during international travel in 50 major cities of the countries including France, Belgium, Ireland, Canada and others. Similarly, eCab users can avail the same facility through Meru when they visit India. “This partnership will increase the reach of our five million customers, a large chunk of which is mobile, to use the services of eCab in the countries where it is operating,” Meru Cab Chief Operating Officer Prem Kalliath said. “With this strategic alliance, Meru expects a growth of 25-30 percent by the end of this quarter,” added Prem Kalliath. Though it has been launched in six cities, Mumbai, Delhi, Chennai, Hyderabad, Bangalore and Pune, Meru is planning to expand it to all the 23 cities by the end of this year. Established in 2007, Meru is serving 23 cities here with a fleet size of 20,000 taxis while eCab, incubated by Taxis G7, has a fleet of 13,000 affiliated taxis.